According to Adrian Gonzalez, President of Adelante, SCM, Supply Chain Operating Networks are the business equivalent of LinkedIn and Facebook. These cloud-based networks can enable companies to embrace collaboration and realize huge efficiencies. But Supply Chain Operating Networks are few and far between. One of the reasons for this absence is because the majority of technology traditionally used by supply chains have been housed within the “four walls” of individual companies. New SaaS, cloud-based technologies like Kuebix TMS are changing this. As traditional, on-premises transportation management systems become replaced by SaaS, cloud-based ones, companies have the opportunity to digitally connect with one another via new Supply Chain Operating Networks. Kuebix is the first TMS to fully embrace this concept, with Kuebix’s technology acting as the backbone for a rapidly growing community. The swift growth of Kuebix’s shipping community is proving the idea that the Network Effect can be used to great advantage in the supply chain industry. With over 16,000 companies in the Kuebix’s shipping network, thousands of suppliers, shippers, carriers, brokers, and other supply chain players are able to connect with one another for new collaboration opportunities. These opportunities can lessen the impact of tightening capacity, help fill empty backhaul miles and ensure that shippers are always aware of the most cost-effective and customer-friendly options to ship. Read an excerpt of Gonzalez’s eBook, Putting Community in TMS: Enabling the Network Effect in Transportation Management, to learn more about the Network Effect in transportation and supply chain operations. Transportation management is inherently a network-based business process. It involves an ecosystem of different parties — a community, if you will, of shippers, carriers, consignees, brokers, and others that need to communicate and collaborate with each other in order to transport products and utilize assets and labor as efficiently as possible. This transportation community is analogous to the connections and relationships enabled by social networks like Facebook and LinkedIn. A big difference, however, is that unlike Facebook and LinkedIn, which are powered by network native software, the transportation community has historically been powered by enterprise-centric software — that is, transportation management systems (TMS) that were designed for, and used primarily by, the transportation function within the four walls of a company. This fragmented, “inside the four walls” approach makes it challenging to quickly and efficiently match transportation demand with available capacity, as companies of all sizes experienced in 2018. This growing need in the market for better matching of supply and demand, coupled with the rise of cloud computing, software-as-a-service (SaaS), application programming interfaces (APIs), and other emerging technologies, is driving the next evolution of transportation management systems. Simply put, transportation management systems are transitioning from being “inside the four walls” applications to becoming operating systems that power transportation communities and enable network effects. Click here to download the full eBook! Transportation management systems (TMS) are becoming more and more common throughout the supply chain. TMSs used to be reserved only for the largest shippers and cost exorbitant amounts of money, making them inaccessible for shippers with smaller freight spends. With the dawn of Software as a Service (SaaS) technology and cloud-based systems, any size company that ships freight can implement a TMS to improve their logistics operations without breaking the bank. Take a look at our infographic to learn more about how a TMS can bring improvements from initial customer order to post-delivery. A TMS will centralize all information so that every stakeholder in the supply chain can easily view and access the same data as their peers. Working off of the same set of information reduces the risk of error and makes processes flow more smoothly. With the addition of an ERP integration, orders flow automatically into the TMS for easy rating and booking. Instead of rekeying orders, logistics professionals have all the order information at their fingertips! One of the basic, and most potentially lucrative, functions of a TMS is the ability to compare multiple rates from different carriers side by side. Instead of navigating to dozens of different carrier websites (or worse of all, not comparing rates), logistics professionals can quickly select the rate and service type for each shipment that saves the most money and delivers the best customer satisfaction. 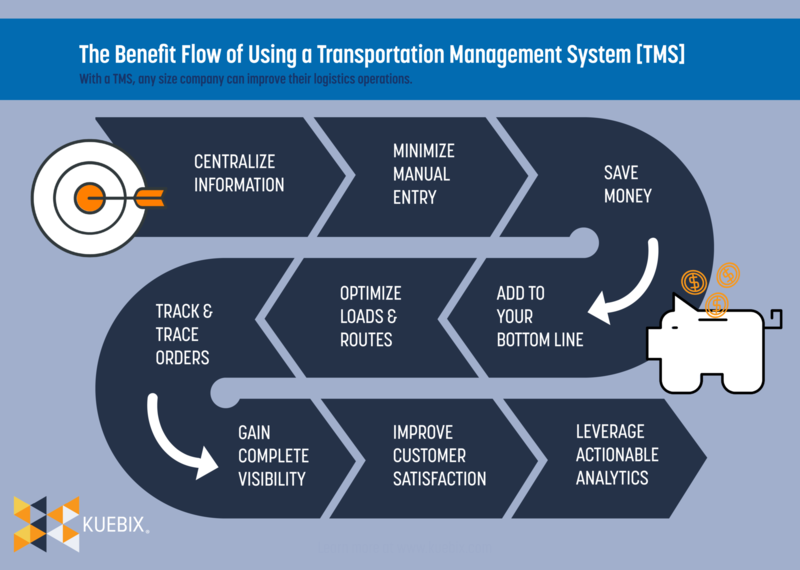 Optimization tools built into a TMS help logistics professionals build the optimal load and route with the help of algorithms. Parameters can be inputted ahead of time to specify how the load needs to be built, and the technology suggests the optimal consolidated shipment and lane. This helps to cube out every truck, save money on fuel expense, and reduce the number of touches an order undergoes. Being able to track and trace orders down to the SKU level improves Customer Service teams’ ability to inform customers of changes to their orders and troubleshoot issues as they arise. It also means that teams can proactively make changes and maintain a complete understanding of their supply chain. With all of this data housed in one place, reports and dashboards can also be access directly from the TMS. All of the aforementioned benefits contribute to improving customer satisfaction. Orders can be processed more quickly, booked for cheaper rates, and remain visible throughout every node of the supply chain. This helps shippers meet rising expectations around shipping costs and times. Knowing when an order will be late and proactively communicating that with the customer will go a long way to building strong customer relations. Even after an order has been delivered to the end customer, a TMS doesn’t stop providing benefits. All shipment data is stored within the TMS and can be viewed in customizable reports and dashboards. Shippers can analyze overall carrier performance, make changes to their standard processes, and proactively leverage the analytics to improve customer satisfaction and lower costs. Continuous improvement programs are important for reducing waste within your transportation processes – and overall business environment. With rising freight rates, lack of capacity, and the driver shortage, transportation operations must create strategies to eliminate waste, while lowering costs and boosting efficiencies. Continuous improvement is defined as “a method for identifying opportunities for streamlining work and reducing waste.” Often businesses and manufacturing companies create continuous improvement initiatives to eliminate waste throughout their organization, including too much inventory, movement, time, and more. Establishing a formalized continuous improvement program helps companies identify cost-saving opportunities and work better and smarter. What constitutes waste within a transportation operation? One of the biggest wastes in transportation is empty trucks. This could refer to empty backhauls, insufficiently cubed out trucks, and trailers that lay empty in yards because a process to track them isn’t easily available. In a world where there is a capacity crisis and roughly 10 loads for every available truck, it’s unthinkable that there should be empty capacity. Supply chain professionals can work on continuously improving their trailers with the help of technology. There are many ways technology can aid in continuously improving the efficiency of trucks. Technology like Kuebix’s FleetMAX program helps pair available backhaul capacity with matching freight to fill empty miles. Rating and booking with a TMS allows shippers to compare different modes side-by-side to optimize their shipments and optimization technology can be used to build the best load and route for every order. Adding in a modular yard management system (YMS) can help to streamline operations in the yard and at the dock, making truck turn-around time faster and wasting less capacity. Another common waste in the supply chain is the underperformance of carriers. When a carrier shows up late, doesn’t have the right size truck, doesn’t have the right number of people to help load and unload, or, even worse, doesn’t even show up, your transportation operations suffer, along with customer satisfaction. Establishing and measuring key performance indicators (KPIs) and sharing these results with your carriers can help to improve their performance and keep your operations running smoothly. Predictive analytics can be used to generate scorecards on carrier performance to show savings to upper management. Leveraging analytics to continuously improve your supply chain can reduce freight spend by 10-20%. Many TMS systems include business intelligence and reporting capabilities, which can be used to help management make better decisions. These decisions can lead to continuous improvement of transportation operations. By continually improving these operations, your business can lower costs, better meet customer expectations and sustain profitability. If you are doing business the same old way you have been doing for years, then you are not continually improving. With a continuous improvement program, your business will strive for excellence – and will deliver significant value to customers and shareholders.